Gunmen disguised as clowns at a children's party shot the eldest brother of Mexico's once powerful Tijuana drug cartel family to death on Saturday. Francisco Rafael Arellano Felix, 63, was gunned down at a family event Friday in Cabo San Lucas, special investigations prosecutor Isai Arias told reporters. "He was hit by two bullets, one in the thorax and one in the head," Arias said, noting that relatives ID'd the former drug lord's body and there have been no arrests. The gunmen were dressed as clowns when they shot Arellano Felix at the party in the luxury Casa Oceano tourist residence, agents close to the case said. All this makes the Northampton Clown seem suddenly harmless. The Arellano Felix brothers once dominated drug traffic between Mexico and California through the brutal Tijuana cartel, inspiring characters in the film Traffic. Most of the Arellano Felix brothers have been either killed or arrested, leaving the cartel in tatters in the present day. Infighting also weakened the group. 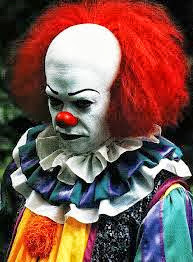 The shocking clown murder is likely due to unpaid old debts, and old retributions from the height of the group's power between 1990-2000, experts say. Nicknamed "El Menso" (The Dummy), Francisco Rafael was arrested in 1980 in San Diego for selling drugs, but slipped back to Mexico when he was released on bail. In 2006, he was extradited to the United States and was sentenced to six years in prison after he confessed to selling drugs to an undercover agent. In 2008 he was released, earning significant time off his sentence for good behavior, according to his attorney at the time, and repatriated to Mexico. The Tijuana Cartel has been completely dismantled, with all of its leaders in prison either in the U.S. or in Mexico, according to drug officials. Rivals like Joaquin "El Chapo" Guzman's Sinaloa Federation, which also began around 1990, have eclipsed the Tijuana group and taken over its territory. The Sinaloa group, based in the western state of Sinaloa, is Mexico's biggest drug cartel, rivaled only by the Zetas, who are most active in northeastern Mexico.